North Korea: China's Largest Drug Dealer? North Korea is likely to be a major target in China’s new war on drugs. As The Diplomat has been following closely, China recently launched a crackdown on illegal narcotics in the country. So far, public reports have indicated that the main targets in this stepped up war on drugs are high-profile celebrities and foreigners from Western nations and Asian countries like South Korea and Japan. However, the biggest loser in China’s new war on drugs is likely to be North Korea. It has long been documented that large amounts of North Korean-produced narcotics are smuggled across the border into China either for sale there or for shipment elsewhere. This used to largely consist of opium and heroin but in the last decade or so those drugs have seemingly been surpassed in volume by insanely pure methamphetamine (along with other synthetic drugs like MDMA, the main ingredient in ecstasy and molly). North Korea is believed to be a major source of synthetic drugs in China, such as crystal meth (often called “ice” in both countries). A 2010 Brookings Institution report on North Korean drug smuggling noted: “Across China, more than 70 percent of drug addicts abuse heroin, but in Jilin Province [on the North Korean border] more than 90 percent of addicts abuse new synthetic drugs and ice in particular.” While there are a lot of synthetic drug users in Yunnan Province, which borders Southeast Asia’s notorious Golden Triangle, this appears to be because the province is used as a hub to smuggle synthetic drugs out of China into Southeast Asia. A recent in-depth Chinese state media report on China and Vietnam’s joint anti-narcotics efforts cited numerous cases of heroin being smuggled from Southeast Asia into China. However, on synthetic drugs the story was reversed: “While China has placed huge resources toward stemming the flow of drugs, new synthetic drugs from China are finding their way into to Southeast Asian countries like Vietnam, complicating anti-drug trafficking work.” All of this suggests that North Korea may be a huge target in China’s war on drugs. 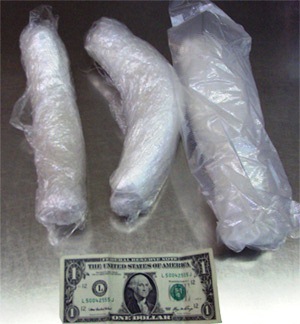 While ice appears to predominate North Korea’s drug smuggling these days, it is certainly not the only drug. It has long been speculated that the rise of ice in North Korea was fueled in part by poppy plants being destroyed by the heavy rains that swept through northern North Korea during the middle of the 1990s, which contributed to the country’s famine. However, recently opium has seemingly been making something of a comeback. Two of the South Koreans recently executed by China for drug smuggling were arrested for trying to smuggle opium into China from North Korea. Similarly, the Chosun Ilbo, a South Korean daily, reported just last week that North Korean-grown opium is once again “flooding the Northeast Chinese market.” The same report also said that Chinese security forces had begun setting up barbed wired fences along the border near North Korean towns known for their drug production in an effort to stem the flow of drugs into China. The timing of this and other reports is interesting. It’s impossible to know for sure just how much of these drugs are smuggled into China from North Korea, and it’s quite likely that the Golden Triangle countries still account for a plurality of drugs smuggled into China. Still, the amounts coming from North Korea are large. According to South Korean officials, Chinese authorities seized $60 million of North Korean drugs in 2010, and Seoul officials said that this was only a “fraction” of what is actually smuggled. It’s possible that the North Korean regime has scaled back its involvement with drug trafficking in response to Chinese pressure, or because drug addiction is believed to be rapidly rising within the DPRK itself. At the same time, the fact that state entities themselves are not being used to traffic narcotics does not mean that senior members of the regime are not directly involved in the trade. North Korea’s informal “princelings” group, called the Ponghwajo — which current regime leader Kim Jong-un is believed to be a huge part of — has long been tied to drug trafficking. Furthermore, the volume and purity of the meth being smuggled out of North Korea suggests some state-level support, many experts say. Still, there’s little doubt that private drug traffickers do exist in North Korea’s border regions. In any case, the steadily deterioration of Sino-North Korean relations in recent months gives Chinese authorities less incentive to use restraint in trying to root out the drug pipeline along its border with North Korea. Even if Chinese state media reports don’t directly implicate North Korea, Pyongyang is almost certainly a major target of China’s new war on drugs. There's been a rapid increase in both drug use and drug-related arrests in China recently.